I think that overall “The Power of Habit” was so-so book, when it comes to the concept of changing one’s habits. There are many better positions about this and free content of much higher quality. Charles Duhigg made an enormous service to the society as a whole by popularizing the concept of habits in the consciousness of the general public. “The Power of Habit” was the first ever book about habits that broke into mainstream. Because of this book, others could follow with more books about habits and changing an individual’s behavior for good. My mentor, Steve Scott, wrote the whole series of books about habits, a few dozen of them! Gretchen Rubin wrote a brilliant transformative book, “Better than Before.“ Brendon Burchard published his book about top performers’ habits. James Clear and Leo Babauta developed thriving blogs (hundreds of thousands subscribers) around the concept of habits. None of the above would be possible without the breakthrough “The Power of Habit” made into the mass culture. It definitely has downsides, but this book also did its job to the T and then some. This book narrowed down a human habit to a habit loop that is stored in the brain. Our habits are so much more! It’s like saying that human speech is a series of neural impulses firing in the brain. Our speech is a means of communication, a gate to higher and abstract concepts, a way to organize huge projects that one person cannot handle, a fabric of human relationships, a way to articulate our emotions to each other and so on, and so on. Yes, the “structure” of a habit is stored in the basal ganglia in the form of a habit loop. Nope, it’s not all. My favorite example is my writing habit. Since 23rd of September, 2013 every single day I have been writing several hundred words. I have the 100% success ratio. No automatic trigger ignites this activity. The activity itself is not automatic. I write in various different forms (blog posts, Quora answers, income reports, articles, nonfiction books, a novel, fiction short stories and more), in two different languages (my native Polish and English), in different places (at home, on trains during my daily commute and even at work) and at a different times of the day (in my writing log you can find every single hour of the day). You cannot fit my writing habit into a narrow definition of a habit loop. It’s an Endpoint, Not a Reward. This pitfall is actually the fault of scientists’ perspective skewed by the research they conducted on animals. In their brain research, they were experimenting on laboratory rats. They trained them to find a way to a piece of chocolate in the labyrinth. After some time, the animals were habitually finding the way to the treat. The taste of chocolate was closing the loop and completing the habit in their brain. If they didn’t find the chocolate, they were confused because the loop in their brains was still active. Well, we are not rats, life is not a labyrinth, and chocolate is evil (surely for me, with my sweet tooth). However, my experience suggests that you don’t need a reward at the end of the loop, you just need a clear endpoint. While I wait for a suburban train, I meditate for a few minutes. The cue for my meditation habit is arriving on the train platform, the routine is my meditation, and the “reward” (you see how inappropriate the name is in this context? Let’s call it an endpoint from now on) is arrival of the train. The way to the office by subway takes me almost exactly ten minutes. On the way to work, I read a book written by a saint. On the way back home, I practice speed reading. The cues are finding a place in a subway train. The endpoints are arrivals to the destinations. The author describes “the power of weak ties” of social networks, and claims that it helps [us] understand the rise of social movements — which it clearly does. But in his explanation, networks are rebranded as “the habit of peer pressure.” Networks — as well as peer pressure, or culture — can be powerful forces for change, undoubtedly. But networks are not habits — as per his own definition. Different phenomena are conflated into the concept of habits, and in doing so the concept loses elegance and consistency. I tend to agree. Those parts diluted the book’s message. On the other hand, I think they were necessary to popularize the book, and I consider the impact of “The Power of Habit” into mass audience its main advantage and mission. If not for those parts, “The Power of Habit” wouldn’t have got the attention of corporations and organizations. It would have been just another self-help book calling people to change their lives. Parts II and III demonstrated that there is business in habits. Good companies thrive because of good systems, and those systems are based on individuals’ habits. What is more, Charles unwittingly tackled the truth that only recently broke into the knowledge of scientists researching change in human behavior: changing habits individually is a losing proposition. It’s like hitting the nails with your hand instead of a hammer. It can be done, but the results are so much worse, and the price is so much higher. The default way to change your habits should be in a group setup. When you involve even a single other human being, your chances for success skyrocket. So perhaps those parts of the book weren’t as aligned to the main message, but they were both necessary and accurate. As a result of all the above cons, “The Power of Habit” is not the book I would ever recommend to someone who wants to change their habits. However, it’s wonderful if you want more knowledge, especially about the state of science about the human brain and habits. The whole book, and multiple stories instanced in it, makes also a compelling case for the utmost importance of habits in our lives. 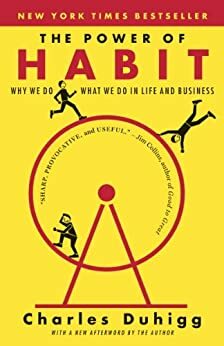 I can recommend this book with all peace of mind to anyone who thinks that habits are not important, tedious, not interesting, boring, insignificant or limiting. This is the best book on Earth to preach about habits. And I discovered in my coaching practice that when you are convinced about the importance of good habits, when you make this conviction a part of your personal philosophy, it’s much easier to actually change your habits and your everyday life. I don’t believe the concept of a habit loop will ever be explained better in the form of written content. Charles made it comprehensive, detailed, illustrated with vivid stories and packed with scientific research. If you want to learn about the ins and outs of a habit loop, the first part of “The Power of Habit” is a go-to place. Period. Charles based his book on scientific research but, in this case, he was ahead of his time. “The Power of Habit” was published in 2012. BJ Fogg, the head of Persuasive Lab on Stanford University, admitted only at the end of 2015 that he overlooked the importance of social interactions in bringing the change in individuals’ habits. Social support can make or break your resolve to change. Charles didn’t articulate it in those words, but the impact of habits of crews, teams and crowds on businesses, organizations and societies painted a very clear correlation. I applaud him for that. -the breakthrough book that brought habits into the mainstream culture. The post The Power of Habit Book Review appeared first on ExpandBeyondYourself.